Lundby is one of the world's oldest manufactured doll's houses dating back to 1945 and the most contemporary when it comes to look. Lundby was founded by Danish couple Axel and Grete Thomsen when they moved to Gothenburg, Sweden. Hence the house being called the Gothenburg house. 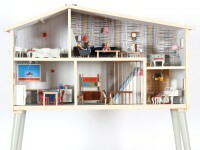 Lundby pioneered the doll's house's fitted electrical lighting system to be found in every Lundby house. The result of these endeavours makes Lundby one of the strongest doll's house brands on the market worldwide. The beauty of Lundby is that new ranges of furniture and accessories are constantly being developed to keep the Sweet Lundby Home fresh and contemporary. Since 1945 Lundby has followed trends, fashions, inventions and new lifestyles. Today, theLundby Home is fitted, of course, with a microwave and a home computer, as well as a CD player and stereo, while furniture, mats and other accessories have a 21st century design. The current range includes the Smaland Doll's House whose origin began as the Gothenburg House and bears the same shape but now more contemporary look. Then there's the architect-designed Stockholm Doll's House with pull-out pool and the Gotland Doll's House which is an eco Summer House.